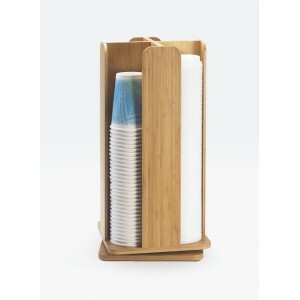 Bamboo Revolving Cup/Lid Organizer - Cal-Mil Plastic Products Inc.
Keep your cups and lids easily accessible with this modern and stylish revolving organizer. This unit is constructed of a bamboo body that is both Eco friendly and stylish, and holds cups and lids at your convenience. It also has a revolving feature that both the attendants and customers can use at all times!